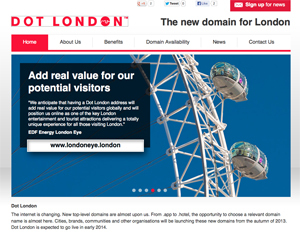 London & Partners, the Mayor’s promotional organisation for the capital, has claimed more than 200,000 businesses are likely to register for the new London-specific domain names, which go on sale on 29 April. A YouGov survey of small businesses, conducted on behalf of London & Partners, found more than one in four (26%) companies were likely to register for the domain name. According to the Business Population Estimates 2013 report, published by the Department of Business Innovation & Skills, there are 839,000 SMEs in London. This could mean 218,140 businesses would be interested in purchasing .london domains for website and email addresses, according to London & Partners’ research. The online survey, which consisted of 1,001 small business decision makers in London, found 41% of companies said a .london web address would help customers find them more easily, and 27% said it would help generate more sales. Gordon Innes, chief executive of London & Partners, said: “This is an incredible response from London’s small business community which sees .london as an opportunity to claim an exciting new web address that is uniquely associated with our city’s powerful brand. In 2013 London & Partners secured the new .london domain in a deal with the Internet Corporation for Assigned Names and Numbers, the global internet body. London & Partners set up a subsidiary, Dot London Domains, to operate the new registry in partnership with web-domain company Minds + Machines.